Book Expert Handyman Services in Kensington! When you've got a collection of small maintenance tasks that you need to get completed to ensure the smooth running of your home or business, look no further than our handyman services Kensington W8. We can help with a huge number of odd jobs around the home, from the relatively minor like fixing a light fitting to major re-modelling jobs. Every handyman Kensington has more than a decade of experience in the trade, so we're supremely confident that no matter what it is that you need some expert assistance with, we'll be ideally placed to help you. Each tradesman's goal is to deliver satisfying results. We get our job done using innovative tools. Call us at a time convenient for you. We fully guarantee our work. Clear Pricing System We don't have any additional or hidden charges. Reliable Technicians Every handyman Kensington is background - vetted & carry ID. Flexible Booking Slots We offer a variety of booking options, for your convenience. From interior & exterior painting to painting of woodwork, we cover it all! 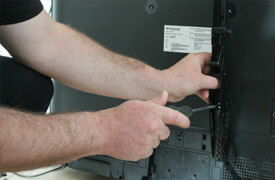 We can mount your TV safely & proficiently. Receive the bathroom of your dreams by booking with us.